They put a sign in the window, stating the following: "HELP WANTED. Must be able to type, must be good with a computer and must be bilingual. We are an Equal Opportunity Employer." A short time afterwards, a dog trotted up to the window, saw the sign and went inside. The office manager looked at the dog and was surprised, to say the least. However, the dog looked determined, so he lead him into the office. The manager said, "I can't hire you. The sign says you have to be able to type." The dog jumped down, went to the typewriter and proceeded to type out a perfect letter. The manager was stunned, but then told the dog, "The sign says you have to be good with a computer." The dog jumped down again and went to the computer. The dog proceeded to enter and execute a perfect program, that worked flawlessly the first time. 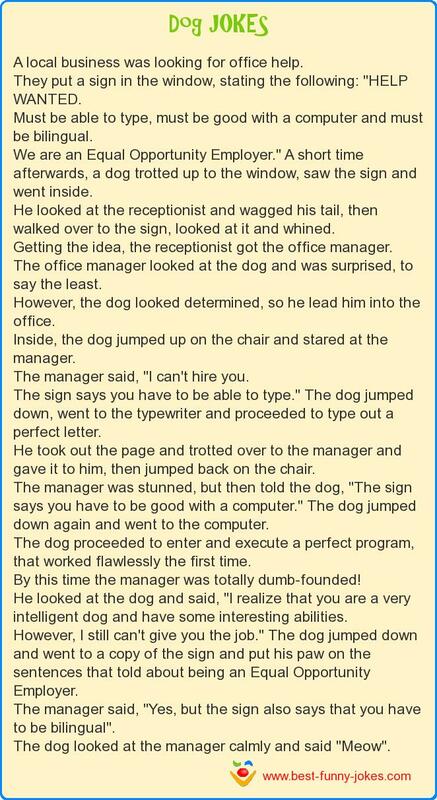 By this time the manager was totally dumb-founded! He looked at the dog and said, "I realize that you are a very intelligent dog and have some interesting abilities. However, I still can't give you the job." The dog jumped down and went to a copy of the sign and put his paw on the sentences that told about being an Equal Opportunity Employer. The manager said, "Yes, but the sign also says that you have to be bilingual".